Be the first to share your favorite memory, photo or story of Earnest . This memorial page is dedicated for family, friends and future generations to celebrate the life of their loved one. Mr. 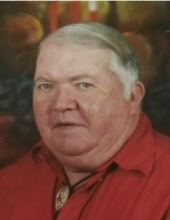 Earnest “Tubby” Spencer, age 74, of Wallingford, Kentucky, passed away Tuesday morning, March 26, 2019, at his residence. He was born September 30, 1944, in Lewis County, Kentucky, a son of the late Lonnie and Cholechetta Sparks Spencer. Earnest was a member of Petersville Church of Christ and he enjoyed fishing, singing, loafing with Brother Arnold and spending time with his family, especially with his granchildren. In addition to his parents, he was preceded in death by two brothers, Elbert Spencer and Wilford Spencer, and one sister, Barbara Meadows. Tubby is survived by his wife of 52 years, Bina Little Spencer; two sons and daughters-in-laws, James and Amy Spencer of Wallingford, Kentucky, and Brian and Danielle of Winchester, Kentucky; one daughter and son-in-law, Tammy and Anthony Toller of Wallingford, Kentucky; five grandchildren; four great grandchildren; and one sister and brother-in-law, Marie and Harold Newsome of Minerva, Kentucky. He also leaves many other family members and friends who will sadly miss him. Funeral services will be held at 11 a.m. Saturday, March 30, 2019, at the Petersville Church of Christ with Brother Arnold Howell officiating. Burial will follow in the Muses Mill Cemetery in Muses Mill, Kentucky. Friends may visit from 6 p.m. to 8 p.m. Friday, March 29, 2019, at Tollesboro Funeral Home & Cremation Services, 11918 KY 57, Tollesboro, Kentucky 41189. Tubby will lie in state one hour prior to the service on Saturday at the church. Tyler Toller, Curtis Spencer, Matthew Evans, Colton King, George Kendall, Johnothan Kendall and Anthony Toller will serve as pallbearers. Acey Spencer, Cloey “Buggy” Spencer and Andrea Morgan will serve as honorary pallbearers. "Email Address" would like to share the life celebration of Earnest "Tubby" Spencer. Click on the "link" to go to share a favorite memory or leave a condolence message for the family.